Isn't it lovely to have a cool, rainy, grey day after weeks of sweltering heat and sun? I enjoyed a hot coffee this morning before heading off for swimming lessons. I've been off coffee when it's so hot, getting my caffeine fix from strong iced tea or iced capp's from Timmie's. We've been taking advantage of the beautiful weather to hang out in parks and backyards with family and friends. Right now the girl's are quietly playing with play-doh at the kitchen table, a switch from the running around and fighting from the last few weeks. (I take that back, I just had to go break up a fight). Tomorrow is the big day, the 22nd Annual Downtown Chili Cook-Off from noon to 3 pm. I've been attending this event for years with various friends, but this year it's extra exciting, as I'm one of the judges! 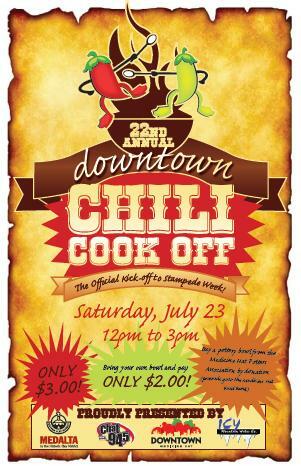 The weather looks promising and in addition to the 40+ chili teams, there will be street performers, and I'm guessing, more than a few sidewalk sales. The cost is $3/person or $2 if you provide your own bowl. You can also purchase a bowl from the pottery club, the proceeds go to the food bank. This is a great way to kick-off Stampede week, so make sure to include it in your weekend plans!